With the new package showing up in a few weeks, we are busy prepping the site and equipment for the new queen. 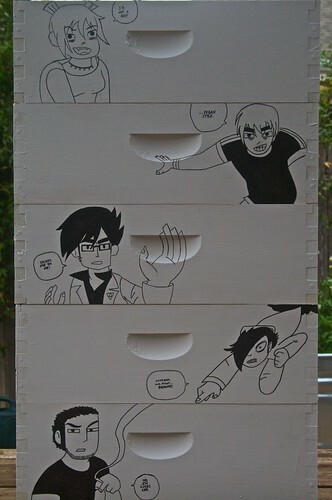 As a huge fan of the Scott Pilgrim comic series (and the subsequent movie), the photography/artistic unit have been expending their energies drawing/inking/lettering the 7 evil exes on the hive supers. Here is a snap shot of the progress so far, and I’ll be adding photos in the upcoming weeks of the final results. Obviously the new queen’s name will be Queen Ramona Flowers. 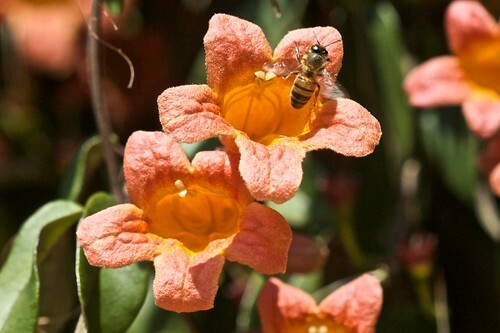 This is the first year I’ve really noticed bees on our cross-vine. We planted it because hummingbirds are really supposed to like it, but I don’t think I have really ever seen any sort of bird/insect interested in this plant until today. I’m glad something is taking advantage of it. I was using newspaper as the initial ignition source in my smoker, but since I don’t actually receive a newspaper at home, it was always a pain remembering to pick one up when I was out and about. 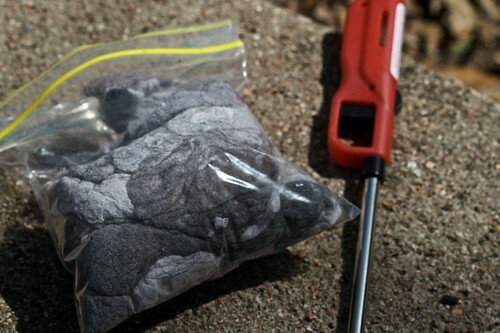 I decided to start saving all the lint from my dryer to see if would work well as an alternative to paper. I’ve used it a few times now, and I think it works great. I also now believe all the stories about how if you don’t clean out your dryer vent on a regular basis, it is just a matter of time before your house ignites into a fireball of Downy freshness. 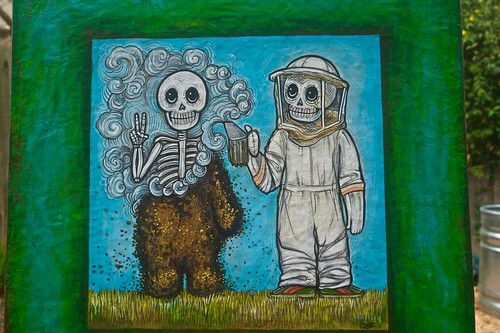 I’d be remiss if I didn’t share the opposite side of the Day of the Dead piece I commissioned from Cindy Raschke. Since the medium is basically one gigantic piece of paper-mâché, she painted both sides. I’m sad this side won’t be visible once the piece is hung, but it was a bonus I wasn’t expecting, and I wanted to share it. Large Marge is an unstoppable egg laying machine. The girls have already filled out the 6th super I added two weeks ago which meant I had to add a 7th today. I’m getting worried that if they continue at this rate, I may need a ladder for my inspections. My second package of bees can’t get here soon enough so I can borrow some frames from Large Marge to help jump start the new hive and hopefully slow them down a bit. I guess I need to start reading up on how to split a hive, but I’m also worried they are growing so fast that a swarm is inevitable. Anyone have any advice on next steps? For those of you in the Austin area, Round Rock Honey has a Groupon available for a $39 dollar Intro to Beekeeping Class. I took this class in 2009 and really enjoyed it. 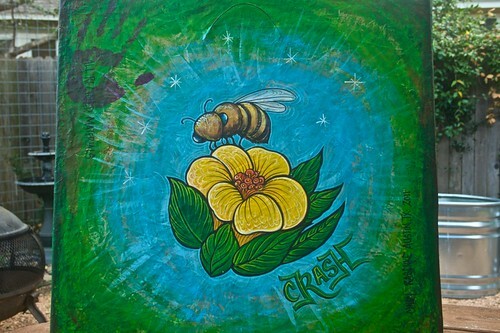 I love Day of the Dead art, so when I ran across a local Austin artist named Cindy “Crash” Raschke whose artwork also showcases this theme, I thought it would be really cool to combine beekeeping with the Day of the Dead and see what happened. I just told Cindy I wanted some skeleton beekeepers, and she ran with it. I think the piece came out great, and I can’t wait to find the perfect place in my home to show off this sucker.